Evolution of Power: China's Struggle, Survival, and Success, edited by Xiaobing Li and Xiansheng Tian, brings together scholars from multiple disciplines to provide a comprehensive look at China's rapid socio-economic transformation and the dramatic changes in its political institution and culture. Investigating subjects such as party history, leadership style, personality, political movements, civil-military relations, intersection of politics and law, and democratization, this volume situates current legitimacy and constitutional debates in the context of both the country's ideology and traditions and the wider global community. The contributors to this volume clarify key Chinese conceptual frameworks to explain previous subjects that have been confusing or neglected, offering case studies and policy analyses connected with power struggles and political crises in China. A general pattern is introduced and developed to illuminate contemporary problems with government accountability, public opposition, and political transparency. 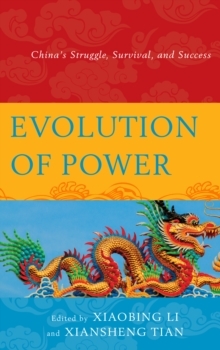 Evolution of Power provides essential scholarship on China's political development and growth.